Every day of the year, the Mayor's Alliance for NYC's Animals' fleet of five Wheels of Hope vans is on the road, transporting pets who are at risk of being euthanized from the city's Animal Care Centers of NYC (ACC) facilities to rescue groups and no-kill shelters with the resources to find them new homes. The New York City Feral Cat Initiative is a program of the Mayor's Alliance for NYC's Animals that is committed to solving NYC's feral cat overpopulation crisis through the humane, non-lethal method of Trap-Neuter-Return, or TNR for short. The Mayor's Alliance for NYC's Animals presents several large, annual adoption events, all with the common goal of finding homes for more of NYC's homeless dogs and cats. These highly anticipated events provide families and individuals with a relaxed, entertaining, and convenient venue where they can meet hundreds of animals available for adoption from numerous shelters and rescue groups, all in a central location. 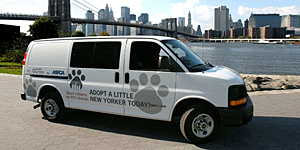 In addition to these large scale events, many weekends throughout the year the Alliance's adoption van brings dogs and cats for adoption "to the people" in neighborhoods throughout New York City. Our adoption van is especially valuable to rescue groups that do not have a physical location to facilitate adoptions. The Mayor's Alliance for NYC's Animals created the Helping Pets and People in Crisis program in 2006 in response to the many requests we received from people facing heartbreaking separation from their pets during times of crisis. The program attempted to provide assistance to individuals and families fleeing domestic violence; seniors requiring medical care outside of their home; and families facing eviction or other temporary setbacks.